What does Quantitative Easing mean for me now? If you have ever heard talk of Quantitative Easing (QE) and “tapering,” you may have been left wondering what it is exactly. The terms are bandied about so frequently these days that it is rather difficult to parse out the facts from the political hype that surrounds every move the Federal Reserve Board, or Fed, makes. When “Old Guy” made the comment that it might be a good idea to explain Quantitative Easing for the readers of Get Rich Slowly, I couldn't have agreed more. So this post is an attempt to explain not only what Quantitative Easing is, but also how it can affect each of us — because, esoteric though it may sound, QE is something which affects us all. To understand where QE came from, we first need to take another quick look at how the economy flows over the course of time. See all those dips, or recessions? The Federal Reserve induced them. Why? The answer lies in the mandate Congress gave the Fed back in 1913, as amended through the years. In simple terms, Congress charged the Fed with managing the economy to maintain full employment, low inflation and moderate interest rates. In order to ensure jobs for a growing population, the Fed by inference has a mandate to do its best to ensure economic growth (typically measured as GDP growth). When the economy recovers from a recession, as it always does, it keeps growing until it reaches a point commonly called overheating. Shortages develop during this part of the economic cycle, especially labor shortages. (I know it is hard to think of labor shortages in today's economy, but it really has happened over and over again, back in the day.) Shortages typically lead to price and wage increases, something we know and experience as inflation. When this occurs, the Fed then tries to cool the economy down; and it accomplishes that by raising interest rates. Rising interest rates is what leads to recessions. The Fed is not trying to shatter your world on purpose. Their goal is just to take the worst edge off things, but the result invariably is that another recession takes place. The holy grail for the Fed through the years has been what they call “a soft landing,” which amounts to just enough slowing down of the economy to relieve those shortages and price pressures without ending up in yet another recession. The economy is a huge, complicated thing, though; and trying to steer it is like steering a gigantic tanker with a tiny rudder whilst navigating a current without the ability to gauge its direction or strength. At first it doesn't look like anything you do makes a difference, so you do more and more — until the tanker suddenly swings much further than you wanted. When the economy goes into recession and people lose their jobs, the Fed attempts to stimulate the economy again by lowering interest rates and increasing the money supply. That is how it has worked ever since the Great Depression: The Fed meets its mandate and manages the economy by making adjustments to the interest rate. However, you can see that, every time, they lowered the rate more than they raised it in the next recovery. You can see the problem that created as the financial crisis unfolded during 2007 and 2008: Basically, the Fed ran out of chart. After they lowered the Fed funds rate to effectively zero and that didn't help, the problem became what to do next. The solution the Fed came up with was Quantitative Easing (QE). So what is Quantitative Easing? 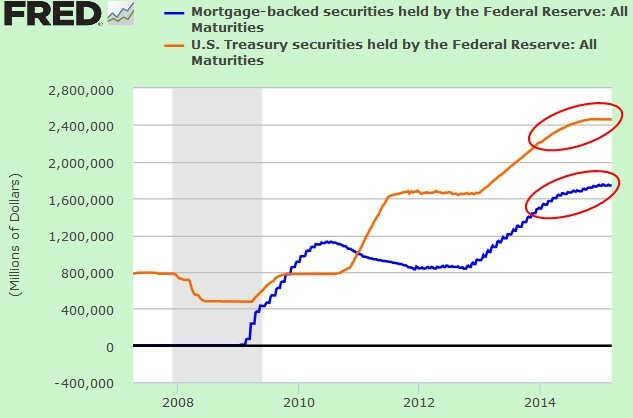 Cutting to the chase, Quantitative Easing involves the Fed buying government debt and mortgage bonds every month from its member banks, effectively putting money in the hands of banks to help them stay afloat and be able to lend money to businesses. Their goal was to stave off the wholesale deflation which devastated the country in the 1930s so they could prevent any more bank collapses and help turn around the economy. The first chart above shows you that the economy has rebounded from the 2009 recession. Now the Fed believes that the need to stimulate the economy with its QE program is diminishing. Afraid of shocking the system too abruptly, they have decided to taper their monthly purchases, hoping to quietly exit the room while the kids are happily playing and won't notice, so to speak. In the red ovals, you can see that the rate of monthly purchases is slowing down. When those purchases stop, normal repayments will lead to a gradual reduction. But the amount of money involved is truly staggering. (That such an unprecedented infusion of cash hasn't led to hyperinflation shows how big the risk of deflation was to the economy.) Regardless of what anyone's political view on the subject of QE may be, the fact is that the Fed now is sitting on over $4 trillion of debt, a number that was unthinkable before the Great Recession. Two things: The first is that, although purchases of new bonds will wind down, that alone will not cause interest rates to rise. As some have put it: Tapering is not like hitting the brakes; it is merely one way to ease off the accelerator. The second thing is that the Fed's management of interest rates has nowhere to go but up. So when the Fed and interest rates appear in the same sentence these days, you know what it means. You may have noticed how the press hyperventilated about Janet Yellen's speech at the Fed's FOMC meeting last week — and how the stock market spiked when she said that the Fed wasn't going to raise rates at their next meeting in late April. What's going on? And how does it affect you? If you look at the second chart, you might notice how, each time the Fed hikes interest rates, the economy goes into a recession. That's what people are leery of, from the speculators of Wall Street to the employers of Main Street. However, if you step back, you can see from the second chart that an interest rate hike leads to a recession inevitably, but not always immediately. This is a roundabout way of saying that we are not too far from the next recession, but it might not happen this year. When it happens, though, you probably know already what to expect: layoffs, freezes, people unable to make payments, and all those bad things. However, this time around, the sheer magnitude of the debt has some people wondering if something else might also happen. We all are well-advised to steer clear of the doomsayers and those who blithely say nothing will happen. The simple truth is that nobody knows. The interesting thing is that this particular set of circumstances has no precedent. Perhaps the closest is Japan who experienced what has come to be known as “the lost decade” after their government tried to prop up the economy during the '90s. Will that happen here? Time alone will tell. No matter the circumstances, there are always winners as well as losers. If there is one commonality among the winners, it is their penchant to be prepared. Have as little debt as possible but as much capacity to take on debt if needs be. Resolve ahead of time to stay the course as far as possible with investing. Position yourself at work as the go-to person as much as possible — those are the people who get let go last. This is not like the Y2K panic or preparing for the world to end; but it's not nothing, either. We don't have to agree with what is being done, but we do need to know what is happening and how it could affect us. Whether we like it or not, the next recession is not that far away any more — but there is still time to get our financial houses in order. Forewarned is forearmed. Do you pay attention to what the Federal Reserve does? How do you prepare for a recession? There are 25 reader responses to "What does Quantitative Easing mean for me now?". Excellent advice on how to prepare for a possible coming downturn, but what about people on the brink of retirement or just retired who are worried about sequence risk? What advice would you give them? I’m recently retired, and my approach is to focus on investments where I only earn income, but never have to touch the underlying investments (either preferred or dividend aristocrat stocks). This means I’ve been unaffected by the underlying value going up or down. It may not be the best approach in everyone’s case but it works for us. Hussman Funds posted an interesting article a few weeks ago titled something to the effect of “If you will need the money in the next eight years, sell the investment now.” That may not be bad advice if you are on the cusp of retirement and can’t afford to see a 30%+ drop in the value of your investments. You may be running into this issue if you’re relying on the “traditional” age-based asset allocation model (i.e. : invest your age in bonds or something like that). What I’ve found most retirees prefer (both for practical and psychological purposes) is using a “bucket method”. Simply set aside the money you might need from your investments for the next 5 years and put that in short-term bonds/cash. Years 5-10, put in 25% to 50% stocks. 10-15 years put in 50% to 75% stocks. And Years 20+ put 100% in stocks. That way, you can know for sure that, even if the market has a bad spell, the money you need for the short-term will be available. That will help you ride out the storm in the event that rising rates do cause a recession. There is so much wrong just in the first third of the article that I couldn’t finish it. What does a chart labeled “The US Economy” even mean? What does the Y axis measure? GDP? But the statement “Rising interest rates is what leads to recessions” really takes the cake. Interest rates are a response to conditions, not a cause of conditions. Interest rates didn’t cause the 2007-2008 crash. Yeah, what DOES the “U.S. Economy” chart represent? GDP? Inverse of unemployment? S&P 500? Very informative William. QE has made my life easier because my mortgage payments are lower but that hasn’t stopped me from trying to make overpayments so that when interest rates do rise I would be that negatively effected. Great post, thanks for sharing. Really great post that spells it out for us mortals. One question: Does it make sense to short sell some index fund tracking stock, given that we can be fairly sure this dip is coming? I generally am a buy-and-hold mutual fund investor, and know just enough to be dangerous. But I have read that short-selling is a way to profit in a downturn. It’s tempting to see this downturn as a fairly “sure bet”, and wonder if that would be a way to benefit. As a follow-on, is there a way to tell if my mutual funds are already doing this internally? Trying to time the market is a low probability gamble but confirming that your portfolio is positioned to allow you to sleep at night during the next market drop shows great wisdom. What sets me apart from most bloggers in the investing and personal finance space is I stay away from specific recommendations. I strongly believe one size does not fit all; every person has to figure out what suits their situation the best. That’s why my posts are big on information, small on recommendations. If one understands sound thinking, and knows how to listen to what’s being said, one makes better decisions. To paraphrase that old saying, I love teaching people how to fish, rather than giving them fish. My own site (link above) is aimed at people who want to learn about investing so they can be self-sufficient and don’t have to rely on (often conflicting) advice. Daniel, keep in mind that a downturn has been a “sure bet” for years now. If you’re worried about losing money in a downturn, I’d recommend selling a part of your investments now and waiting to re-purchase until stocks drop 20% or more. “Quantitative Easing” – My first thought was that the phrase was a new way of saying “layoff”, like “We are going to quantitatively ease our workforce by 10%”. I’d like to point out there are differing views about how the Fed causes recessions. 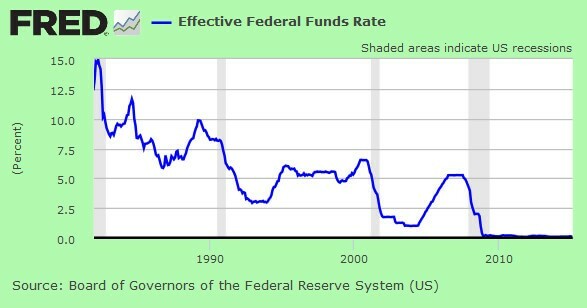 Some view what the Fed has done prior to every recession (low interest rates, monetary expansion which typically leads to inflation) which leads to mal-investments (i.e. housing boom, internet boom). Eventually the market wakes up (the Fed raises interest rates which makes all of those mal-investments upside down/ unprofitable) and the recession begins. I’m from Brazil and the crisis in Petrobras is more difficult to get good analysis of chi market in Brazil, so I have to resort to your blog. This is brilliant. A real explanation of what quantitative easing means, in a way that can be understood by anyone. I found it really insightful. Thanks for the great post. I’m now off to pay off my debts and save my emergency fund! I heard back during the civil war the Union Navy cut off New Orleans from getting supplies which the Confederate states heavily relied on for income from sales to Europe. Once this happened the Confederate states started printing money out of thin air. During the war the confederate dollar was $0.90 cents to the U.S. dollar. After the war it went down to 9 cents. What the Fed is doing is much worse. I hope many people read this article. You hear the term quantitative easing thrown around all the time but it goes over most people’s head. Everyone should have at least a basic understanding of the Fed’s workings. QE is one of those topics that always makes me nervous. But knowledge and preparedness are the only thing we can use to combat it, so thanks for this rundown. Do you pay attention to what the Federal Reserve does? Yes, I do. My business is mergers & acquisitions (in every day terms – I sell companies for people so that they can turn that illiquid investment into cash in the bank). So interest rates and the availability of bank debt to finance the purchase of businesses is really critical to my ability to sell a company. These last few years, with interest rates at such low levels have been great – well, at least since the banks eased off and started lending again. How do you prepare for a recession? My business is highly cyclical, and if I can’t get companies sold, I make no money. So I keep a very large emergency fund, and have no debt other than my mortgage. And event that, we’re paying down as quickly as we can. I think we all need to be aware of the doom and gloom prospects out there. I don’t think a rise in interest rates means recession. If it does, it is a buying opportunity in equities as you can see from history, a downturn was an excellent opportunity to buy on the dips for an index fund or a high quality American company. 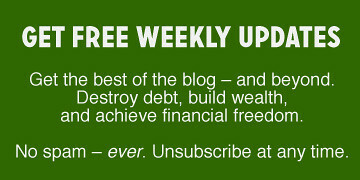 Update: Ben Bernanke (previous Fed Chair) started his own blog. His first post dealt with what the Fed can and cannot do about interest rates. There are too many people out of work to worry about inflation. Don’t let QE scare you and I believe it has ended if I am not mistaken. Not worth taking any more time thinking about than you did reading this post. QE is a fancy term for legalized debasement of the currency. So let’s first start off with asking the question, “what would happen to you if you started your own ‘QE’ program?” That is called counterfeiting and you would go to jail for 15 years. So why is that a crime? Some of the ill-effects that counterfeit money has on society include a reduction in the value of real money; and increase in prices (inflation) due to more money getting circulated in the economy – an unauthorized artificial increase in the money supply; a decrease in the acceptability of paper money; and losses, when traders are not reimbursed for counterfeit money detected by banks, even if it is confiscated. So if an individual does QE, it’s decreases the value of the currency for everyone else holding it… then doesn’t it do the same when the Federal Reserve does it? QE will not end, they will continue to debase the currency until the currency is worthless. Then start over with a new currency. To sooner you are on to their game, the sooner you can protect yourself.